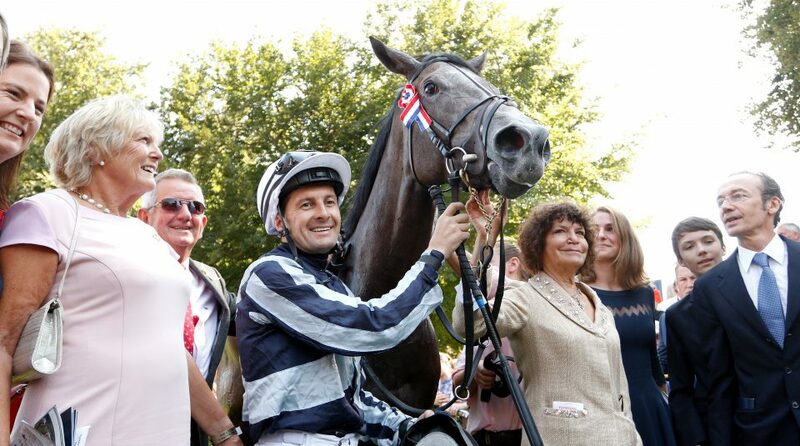 Alpha Centauri is the star system closest to the Solar System and it is little exaggeration to suggest several of the equine version’s victories in 2018 were “out of this world”. She powered to four successive Group 1 triumphs in 2018 – two of them achieved in races that fell under the QIPCO British Champions Series umbrella – until suffering an injury when looking on course to extend her sequence to five at Leopardstown in September. The intention had been to keep her in training but the following day it was announced she would not race again. The imposing daughter of Mastercraftsman, bred and owned by the Niarchos family, did well to overhaul the enterprisingly ridden Could It Be Love in the Tattersalls the Irish 1000 Guineas winner and then came an explosive display in the Coronation Stakes, where powered home by six lengths in what was easily a course record time. Alpha Centauri confirmed herself head and shoulders above the other fillies of her generation with a dominant performance next time out in the Group 1 Tattersalls Falmouth Stakes at Newmarket. A lack of early pace meant Colm O’Donoghue, her regular rider, decided to make his own running up the stands’ rail but it was clear from halfway that she had her rivals in trouble and nothing could get near her as she powered her way to a four-and-a-half length success. It was a similar story in the Prix de Haras de Fresnay-le-Buffard Jacques le Marois against colts and older horses at Deauville. Allowed to stride on with three furlongs to run, she won by two and a half lengths from Recoletos without being fully extended. Alpha Centauri was 30-100 to extend her winning spree in the Coolmore Fastnet Rock Matron Stakes at Leopardstown but after getting upsides Laurens in the final furlong stumbled and faltered. At the line, she was beaten three-quarters of a length. Within 24 hours it had been discovered that she had suffered a chipped bone in her and her connections announced her retirement. As a two-year-old, she won twice over 6f at Naas, including in Listed company, before being beaten a neck by Different League in the Albany Stakes at Royal Ascot. On her only other start as a juvenile, she disappointed on soft ground in the Moyglare Stud Stakes. Alpha Centauri reserved her best for fast going and the heatwave in 2018 was tailor-made for her. Three Guineas winners lined up in the Coronation Stakes at Royal Ascot in 2018 but only one, Alpha Centauri, mattered from a long way out. When Colm O’Donoghue pressed on early in the straight, there would have been some armchair jockeys questioning his judgement. But O’Donoghue knew exactly what he had underneath him and Alpha Centauri powered clear to win by six lengths in scintillating style. She knocked more than a second off the previous best time and there was no better performance during the whole of the Royal Meeting. Timeform went as far as assessing her exhibition of power and pace as the best in a Coronation Stakes “for at least 25 years”. “I was very nervous today as I know she is a great filly. It was rather nice going into the Irish 1000 Guineas as we were very much under the radar, she hadn’t run well on soft ground two runs before that – today we were there to be shot at. Something grey, for starters. Alpha Centauri was silver in shade and so was her sire, Mastecraftsman, winner of the Irish 2,000 Guineas and St James’s Palace Stakes in 2009. Something big, too. Alpha Centauri dwarfed most of her peers as a two-year-old and weighed 520 kilos as a three-year-old. Mastecraftsman was also a big unit – you would not want either horse treading on your toe. Alpha Centauri’s breeding indicated that a mile would be her optimum and it duly was, although she had enough gears to almost win over 6f at Royal Ascot as a two-year-old and was so strong at the finish of her races over a mile that one imagines she would also have stayed a mile and a quarter had she been asked to. Harrington often remarked on her wonderful temperament and her offspring will have a head start in life as a racehorse if they acquire that trait. There will probably be a temptation to believe her stock will want fast ground but she did win a Listed race in runaway style on soft ground, and Mastercraftsman won two Group 1 races on heavy going. Keep an open mind. It will be fascinating to see the liaisons the Niarchos family choose for her over the years to come.